Oak Grange has been specifically designed to provide high quality residential and nursing care for older people, including those living with dementia. Our 24-hour care is provided in a warm, welcoming environment, with delicious meals and a range of daily activities, including a choice of therapeutic approaches. Together with our lively social calendar, this helps stimulate residents’ minds, keeping them engaged and positive. We also offer respite care services for those in need of a short break, as well as day care services. Residents living with dementia are supported in our dedicated Memory Lane Community, which has been specifically designed to help people retain independence, choice and dignity. Features. such as sensory gardens, with low risk walkways, and activity kitchens, are there to enable people to engage in life’s everyday pleasures. Oak Grange has become a focus for the local community within Mollington, developing relationships with schools, as well as leading and participating in community activities and events. The home boasts dedicated GP services, domiciliary dental care, eye care, podiatry services. Oak Grange also offers its own hair and beauty salon, coffee bistro, Wi-Fi connectivity throughout the building, and its own cinema and minibus. We believe you’ll find us ideally suited to meet your needs. Why not give us a call or, better still, pop in and experience Oak Grange for yourself? 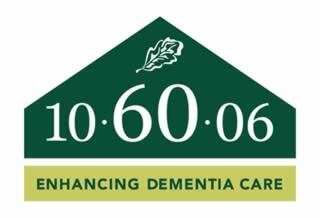 We are proud to be one of the first homes to be accredited as part of Barchester’s 10-60-06 Dementia Care programme, reflecting the enhanced quality of dementia care and improved quality of life experienced by residents here at Oak Grange. Key features of our home are: health and wellbeing services, including dedicated GP services, domiciliary dental care, eye care, visiting hearing aid and podiatry services, as well as our own hair and beauty salon. Oak Grange also features a dedicated Memory Lane Community providing high-quality nursing and residential care for people living with dementia. Welcome to Oak Grange Care Home, my name is Carol and I am the General Manager here. I began working as a member of care staff in Caldy Manor Care home (a sister Barchester Care Home) in 2001, and went on to complete my NVQ level 2 in Care and proceed up to senior care level, completing my NVQ level 3 within this role. In 2004 I was promoted to deputy manager. I was Promoted to General Manager in 2005 and went on to complete the NVQ level 4 in Care and also the Registers Manager Award. Recently I have moved to become General Manager here at Oak Grange. I have been a Registered Manager since 2005 and has gained experience and qualifications to allow me to deliver the best level of care to everyone who chooses to live here by attending Appraisal skills, Safe handling of medicine, Risk management in Health and Safety Leadership in Health and Safety, Legionella ACOP/ guidance; Leadership in Person centred Dementia Care. All qualifications and training I complete I am able to pass onto my teams to enable them also to deliver the care as I would do so and also as I expect. I am responsible for, and have a passion for ensuring that the residents choosing to live at Oak Grange Care Home receive the highest standards of care. Whereas l and the staff team will seek to ensure that each residents care needs are met, they will also encourage and support residents to retain as much independence as they desire through providing a stimulating and pleasant environment and where they are free to exercise their right of choice as to their lifestyle. I have had 3 children who all followed me into the care profession, my oldest daughter has become a Doctor and my other children work in the care home environment. All enjoying the ability to create a better lived experience for the elderly. I have worked in different environments during my work career from Seamstress to shop work, but have never found a meaning to my work until I joined the care profession. My passion was always to look after and provide for my family which I did until they were old enough for me to return to work and I would never had envisaged such a rewarding role as care has given me. Hello, my name is Alison and I am the Deputy Manager and Clinical Lead here at Oak Grange Care Home. I have been fortunate to have a career in nursing that has spanned both the NHS and private sector since 1994. I joined Barchester in 2015 and was privileged to start my employment as a General Nurse and be promoted to Community Manager, then finally to Deputy Manager & Clinical Lead. I have a passion for the care of older people and I endeavour to provide a homely atmosphere for residents and their families, whilst also promoting high standards of evidence-based clinical care. We have a fantastic team here at Oak Grange who are all committed to delivering the best possible care to those we support. I qualified as a Registered General Nurse in 2011 and have been working in the care home sector since 2011. My employment started as a Care Assistant in a residential home; I continued to work there part time whilst training to be a nurse. My experiences in this care home made me passionate about elderly care, which is what I decided to focus my career on. I am now the Community Manager in Oak Grange's General Nursing Community and I have enjoyed making a difference to the lives of residents; my goal is to ensure that people in my care enjoy their time at Oak Grange. I have been working for Barchester since Oak Grange opened its doors in 2012. I live very local to Oak Grange so close that I watched the building grow week on week and often said to myself I am going to work there, and here I am. I was I consider myself to be extremely privileged to work with such wonderful people, full of humour with wonderful stories to tell. I know its a cliché but we are like one big happy family, I love being here! We all know that keeping active is important. We have created a wonderful culture within the home and we work together to give residents the best possible experience. We are here to ensure that residents enjoy an environment that is both stimulating and socially active. We ensure the team knows each residents' preferences, so that we can deliver a person-centered program of events and activities. Essential to our homely feel is the strong relationships of trust we build with residents and their families and friends. The home also has its very own minibus for our numerous outings for coffee and shopping, which residents love. As Head of Maintenance, my day varies from unblocking a drain, to making arrangements for long term maintenance to changing light bulbs. I am responsible for all aspects of the building and gardens, but also for any external labour that may come on to site, to ensure that they follow health and safety procedures and maintain a high standard of work. The Oak Grange Choir comprises residents of all communities, loved ones and staff members. We practice every Monday afternoon and have held Easter, summer holiday, Harvest Festival, Remembrance and Christmas concerts. We've performed on stage in the Chester Cathedral and have toured our own home, performing for residents and bringing joy to those who are less mobile than others. Our choir brings so much joy to everyone and we love singing. Many thanks to our Choir Director, Susan, who has trained us to sing so well.